It’s Wednesday night…time for Ghostbusters. I think this guy has already been on an episode! It’s Etsy Friday and I’ve got some really great dog finds! First is some fantastic original graphic artwork by Etsy seller Gemini Studio. Artist Stephen Fowler creates giclee prints of his original illustrations on archival matte finish paper. This particular print is 12″x12″, but custom and larger sizes are available upon request. It is a hand signed and numbered print. Stephen professes a “fascination with big graphic artwork, vintage/urban design, and advertising posters”. Although Gemini Studio began as a handmade greeting card company, it now includes a variety of media including graphic design, photography and illustration. 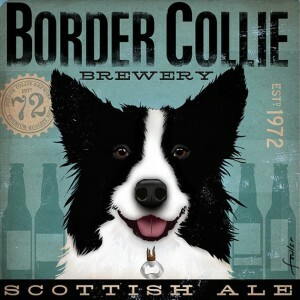 Themes include Cats & Dogs, typography, Chicago themes, Food & Drink, and other beautiful designs. Also be sure to check out Stephen’s website at geministudioart.com. Inspiring! Although his art must look just fabulous on big loft walls, I’ve no doubt it will look just as nice in your home or office (or both)! 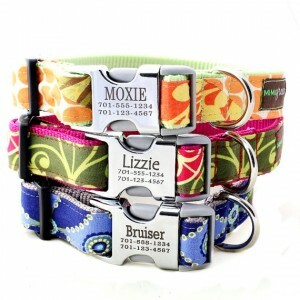 Need a colorful personalized dog collar for your pet? Or an engraved buckle on that collar? Check out these great pieces by Shop Mimi Green! 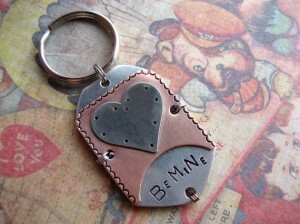 What a fantastic idea to combine the info normally found on your dog’s tag right onto the collar’s buckle. 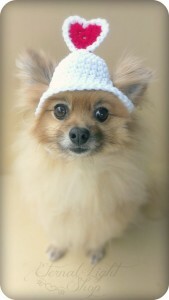 Your pooch will be styling and safe! Buckles are made of a hybrid metal/plastic and are lightweight. 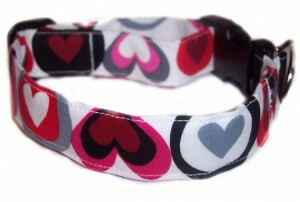 Washable designer fabrics stitched to tough nylon webbing make the collars both durable and easily cleaned. This classic cotton collar comes in 5 sizes and 2 widths. 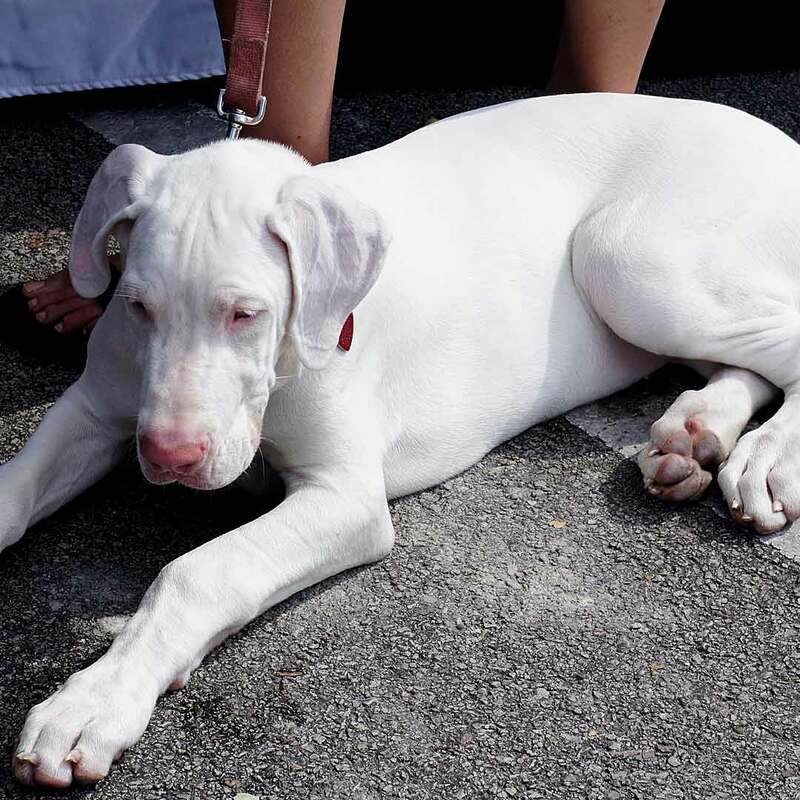 No matter if you have a Great Dane or a tiny Chihuahua, a laminated cotton collar by Shop Mimi Green will fit your dog just right, be super strong and match your dog’s cool style! Be sure to check out their collars in bridal leather (3 colors) and many wonderful shades of the softest velvet. Bring on the messy dinner! 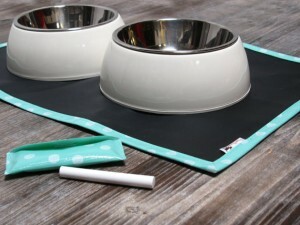 These great oil cloth and chalkboard placemats by Diggity Dawg Designs make cleanup a breeze. The one shown in the photo has a lovely turqoise dot border design, and comes with a single white piece of chalk in it’s own coordinated carrying case. 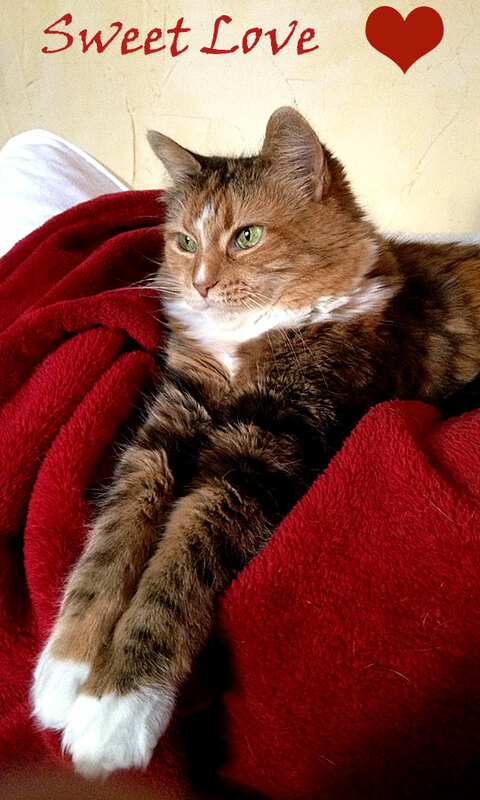 Personalize with your pet’s name or your own endearing words or design. Free your imagination and get creative! I love items that are beautifully and simply designed, yet serve a very practical purpose. These oil cloth and chalk mats score on both counts. They can be used on any flooring, and are easily cleaned by wiping with a wet sponge or damp towel. 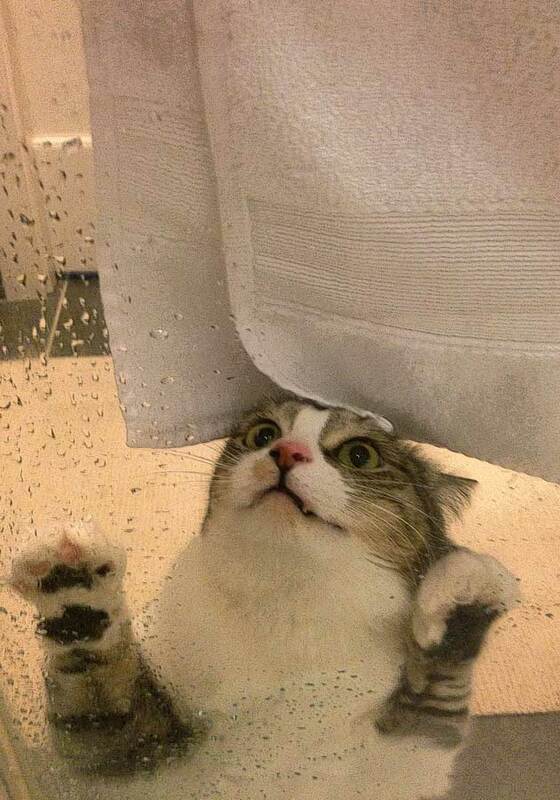 Then just air dry and you are ready to go again! Chalk Mats measure approx. 12″ x 19″ and fit standard size pet food and water bowls. There’s room for two bowls on each mat. Each comes packaged with a custom hang tag which makes them ready for gift giving. When on the Diggity Dawg site, but sure to also check out her toy hampers and cute toys for dogs. 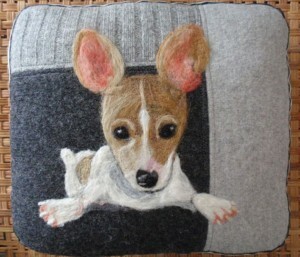 Val’s Art Studio makes some truly detailed and beautiful felted design pillows. I just love this one with the little terrier. So cute! Val needle felts a “painting” out of wool roving onto recycled, felted sweater fabric. Then she uses ribbon and trims on the pillow sides, and a coordinated print fabric for the pillow back. Pillows are stuffed with an organic cotton/bamboo, eco-friendly non allergic batting. These are personalized by using a photo of your favorite pet, and then turned into either a pillow as you see here or a wall hanging. Each is a true endeavor of love! The measurements are approximately 9 x 11″ – 11 x 12″. These are “art” pillows and meant for gentle/decorative use only, and can be created in either the box style design or with a ruffled trim. Let Val know if you have a color preference and she will work with your color palette, keeping in mind that recycled sweaters are used as the base for each of these one-of-a-kind pillows. Also, if you want, your pet’s name can be added to the design for an additional $25.00.